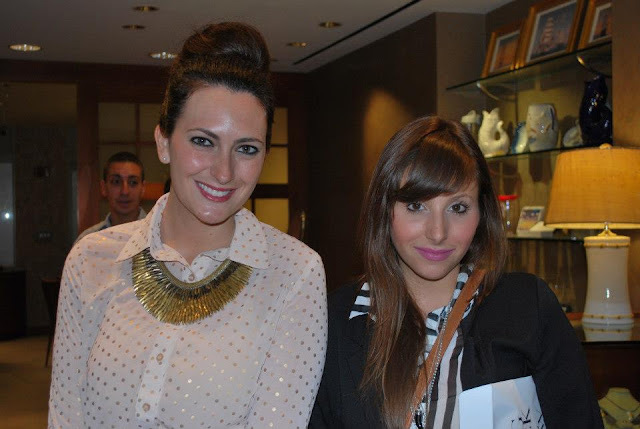 Last Thursday I attended a fabulous event at Lux Bond & Green on Boylston Street in Boston. The lovely Shauna invited us to sip on champagne, nosh on yummy apps, and check out the new Ippolita collection. (Which was absolutely stunning!) We also got to donate some of our designer duds to the Fashion Project to benefit UNICEF. So not only did we get to enjoy a fun night out, but we got to give back to a great cause. Party-goers tweeted throughout the night and jewels were given away at random... Guess who got to take this beauty home with her?! Top: Piperlime; Leather-trim skirt: Piperlime (similar HERE); Wedges: Sole Society (similar HERE); Necklace: Stella & Dot; Bag: Michael Kors; Nails: Essie "Skirting the Issue"
Thank you to everyone who made this event a hit. And to Lux Bond & Green for the gorgeous necklace! I will be back soon, for sure! I absolutely love your look! I enjoy reading your blog and have started my own www.penchantforpretty.com, would love for you to stop by. I love reading your blog! Love the heels and skirt! Glad you had a wonderful event! Love the outfit!! Super chic! Cute photos! Loving your top and necklace! Looks like a fun event! Looks like a fun event! And I love the leather trim skirt! !